Collective Consciousness Theater [CCT] – New Haven’s hidden gem of a theater company – specializes in plays that facilitate a conversation about race. Their last offering, the incredibly exciting “Jesus Hopped the A Train,” was among my favorite shows of 2018, a powerful look at identity and biases based inside the prison system. Their follow-up, “Rasheeda Speaking,” is softer than most CCT shows. It’s funnier too, more buoyant and it occasionally even flirts with satire. In that respect, “Rasheeda” is a nice change of pace for the company. But it’s also less effective than most shows I’ve seen from them, in no parts due to the fine actors assembled by director Elizabeth Nearing, making an assured CCT debut. The problem here lies in the script by Joel Drake Johnson. It has some fascinating ideas and solid moments, but put up against other works CCT has presented recently, by masters like Suzan-Lori Parks, Stephen Adly Guirgis and Dominique Morisseau, “Rasheeda” can’t help feeling well-meaning but clumsy. We open on a doctor’s office in Chicago. Dr. Williams (Ethan Warner-Crane) is telling his office manager Ileen (Susan Kulp) in no uncertain terms that he wants to fire his other receptionist, Jaclyn (Gracy Brown). She’s rude, he says, she’s too angry and she doesn’t fit in with the office. But he has no real evidence against her and HR makes it nearly impossible to let someone go. “Sometimes they protect people who shouldn’t be protected,” he tells Ileen. Maybe, the good doc asks, she can write down some of Jaclyn’s indiscretions so HR will be able to intervene. “We have got to take a stand,” he says, “We’re a team.” Of course, the unspoken truth that reverberates over the next 90 minutes is the meaning of that ‘we.’ Dr. Williams and Ileen are white, Jaclyn is black. Perhaps the line goes too far (would a dotty old woman, even a racist one, think that was appropriate?) but it spells out the play’s intentions clear as the top letters on an eye chart. Is Jaclyn trying to get revenge for her place in the world, for the menial jobs she’s been placed in before, for every stupid comment she gets, for feeling that the doctor never looks her in the eye? Or is she a victim of circumstance and the institutional racism that runs rampant across the country? Or is it all of those things? That’s a fascinating start to a complicated and prescient play, especially one that is often much funnier than my previous paragraphs point to. But in trying to create multidimensional, messy characters, Johnson swerves too hard in the other direction, writing four unpleasant and unidimensional people who are hard to empathize with. For a play that should delve into the grey areas of humanity, Johnson’s script is, if pardon the pun, a bit too black and white. Ileen seems sweet on the surface but is finicky and manipulative; a woman whose “can’t we all get along” sentiments is masking a lot of repressed racism and fear. By the time she becomes convinced Jaclyn will do her physical harm, you begin to doubt her mental stability. Dr. Williams also lives in a bubble. As played by Warner-Crane, he’s one of those fresh-faced doctors who got through medical school and an Ivy League education without really developing any social IQ. He makes casually racist jokes – or perhaps not too casually – and always seems unsure in Jaclyn’s presence. When she tells Ileen that “Dr. Williams doesn’t like socializing with black people” it’s clear exactly what she means. But Jaclyn isn’t very easy to root for either. She’s brash and confrontational. She’s convinced her mysterious sneezing attacks are from toxins in the air, hence her week-long absence and the potted plants and crystals she places around the office. She gleefully rearranges Ileen’s desk drawers just to mess with her head and then lies about it. Besides, Jaclyn is also something of a racist herself – a big topic of ire are her loud and possible drug-dealing Mexican neighbors. Instead of feeling Jaclyn is wronged or Ileen is misunderstood, you watch four unlikable people scheme and bicker as mouthpieces for the author. Brown and Kulp, who are both marvelous actresses, do their best to make Jaclyn and Ileen into fully formed, realistic women and largely succeed on their own strengths. But I wish the writing matched the level of their performances. It does happen once, though. Near the play’s end, Jaclyn has a stunning monologue about her experience taking the train to work. I won’t spoil it, but her tale about the young, white businessmen who call the “large, stern, stone-faced middle-aged black women” on the train Rasheeda is nothing short of brilliant. It’s a flawlessly written piece, ending with a devastating gut-punch of a punchline, and delivered with momentously quiet pain and steeliness by Brown. That moment alone is worth the price of admission. I wish the rest of “Rasheeda” had the grace, subtly and complexity of that monologue. All the pieces are here – Nearing’s direction is swift and thoughtful, the acting is wonderful, David Sepulveda’s detailed set is picture-perfect – but they’re in service of a script that doesn’t quite work. “Rasheeda Speaking” runs through February 3rd at 319 Peck Street, Building 6S in New Haven, CT. For more information visit their website. 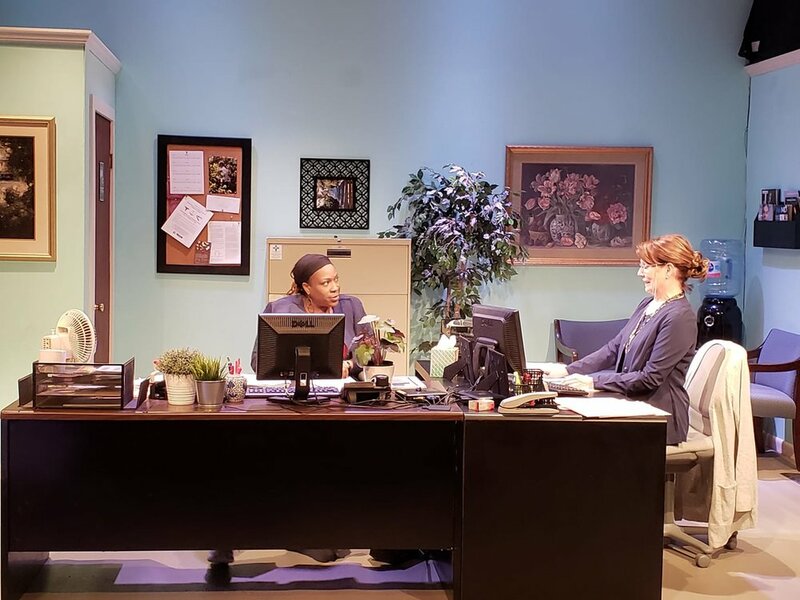 “Rasheeda Speaking” by Joel Drake Johnson is directed by Elizabeth Nearing and stars Gracy Brown (Jaclyn Spaulding), Susan Kulp (Ileen Van Meter), Debra Walsh (Rose Saunders) and Ethan Warner-Crane (Dr. David Williams). The creative team features Ashley Sweet (Stage Manager), Molly Flannigan (ASM/Propmaster), David Sepulveda (Set Design), Jamie Burnett (Lighting Design), Tommy Rosati (Sound Design), Carol Koumbaros (Costume Design), Jenny Nelson (Producer) and Dexter J. Singleton (Producer).